I was given this older book by a friend who is always looking for good used books. This book was compiled by Mrs. Payson after her husband’s death. Payson was a Congregational pastor and educator in Portland, Maine. This book is rare because it was published in 1828, the first date any of his writings were ever published. 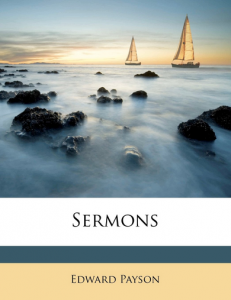 I enjoyed reading these sermons and putting myself in the setting of this kind of preaching, realizing that few churches today appreciate this older style of homily. Even on the written page there is no theatric trick, just straight talk from a Scripture text. Very enjoyable.